Every journey begins with a first step. Take yours by joining our interest list. You will be among the first to receive the latest news about Esplanade Lake Club and updates about construction progress, pricing, floor plan releases and invitations to community events. Discover Esplanade Lake Club where residents will experience a new level of inspired living in a gated lakefront community coming soon to Fort Myers, Florida. Positioned on one of the largest lakes in Southwest Florida, Esplanade Lake Club will provide an excellent waterfront opportunity which allows recreational boat usage, along with a community marina, boat ramp and the option for individual residence boat docks. Homes will feature California-Tuscan architecture with tile roofs and ornamental detailing. Residents will enjoy an array of planned resort-style amenities and discover what it means to live an inspired lifestyle. Esplanade Lake Club is the perfect place to explore, relax, engage and revitalize. Surround yourself with natural beauty and exciting ways to enrich each moment of your day. Come home to Esplanade. From active recreation to relaxing pursuits, Esplanade Lake Club will provide ample opportunities to live a resort-inspired lifestyle in a lakeside setting. Esplanade Lake Club will offer single-family and twin villa homes in a variety of open-concept floor plans. 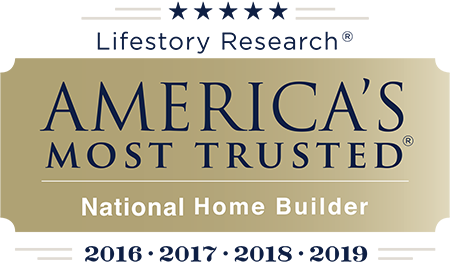 These new homes will be built to the uncompromising standards of quality and craftsmanship that have made Taylor Morrison America’s Most Trusted® Home Builder in 2016, 2017, 2018 and 2019*. They’re beautifully appointed and thoughtfully designed for easy, carefree living. Your home can be personalized from a wide selection of upgrades and options available at our local Design Studio. If you’re hoping to find a quick move-in home, check out our other communities in the Fort Myers/Naples area. Situated on 778 acres in a fantastic Fort Myers, Florida location, Esplanade Lake Club will be positioned on a 352 acre lake that allows for stunning views, boating access, a community marina and more! This new community will be close to Gulf Coast beaches, recreation, dining, entertainment, cultural attractions and shopping. You’ll also have access to major airports, area attractions and top-rated healthcare facilities. Esplanade Lake Club is a great opportunity to live in luxury at one of Taylor Morrison’s beautiful, active lifestyle communities with an additional unique waterfront opportunity. Every day is a vacation at Esplanade and you never need to pack! Esplanade Lake Club is an all-ages community. All information (including, but not limited to prices, views, availability, school assignments and ratings, incentives, floor plans, site plans, features, standards and options, assessments and fees, planned amenities, programs, conceptual artists' renderings, tax rates and community development plans) is not guaranteed and remains subject to change, or delay without notice. Photos are for illustration only and do not necessarily represent actual community. Community improvements, recreational features and amenities described are based upon current development plans which are subject to change and under no obligation to be completed. Community Association and other fees may apply for certain activities and events. This is not an offering in any state where prohibited or otherwise restricted by law. Please see a Taylor Morrison Community Sales Manager for details and visit www.taylormorrison.com for additional disclaimers. © May, 2018, Taylor Morrison of Florida, Inc. CBC1257822. The Esplanade® name and logo are federally registered. All rights reserved.